While serving in World War II, Don Whitman developed a friendship with a fellow sailor who related his experiences of modeling and posing for photographers. While the model’s name is lost to history, it is believed this chance meeting served as inspiration for Don to establish the Western Photography Guild in 1947, upon returning home to his native Denver, Colorado. Specializing in male physique photography, Don Whitman and his Western Photography Guild remained active for the next 50 years. Don also co-founded the Mr. Colorado Bodybuilding Competition in 1950. This annual competition served as a showcase for local talent. He served as the competition director from 1950 until 1972 and photographed many of the competitors. The studio found much success in the 1950s as interest in physique photography grew. However, tragedy struck in 1965 when a freak summer storm flooded Don’s photography studio. His equipment was ruined, and many prints and original negatives were lost. Despite this devastating blow, the studio eventually recovered. This interview originally appeared at the Bob Mizer Foundation website, and has been reprinted here in modified form with the author’s permission. Q: Unlike photography of the female form, male physique photography is seldom considered “art.” What did Don think of this, and other photographers work involving the male form? Do you believe he understood or appreciated the artistic merits of his work? I’m really am not at all sure how to answer this question. It is a question that I never asked him. I think his main gratification from his photography came when he received positive responses from his customers, of which there were many. He maintained a lot of correspondence with his customers and they sent him a lot of notes and letters with their orders. Many of his customers were loyal for years and years. Some of them are still loyal, buying the reprints we offer. I don’t think he really expected to impact or impress anyone beyond those who collected his work. I believe that in later years Don had some concept that his work was good and unique and that he had mastered his craft. But he would never have said it himself, or patted his own back, He was not that way. Q: I understand that at one point in time, Don approached you to take over his business. What can you tell me about that? It wasn’t anything very formal. I was on leave from the Navy and the conversation somehow got around to what I was planning to do when I got out of the service. I was 23 years old and without a clue of what to do when I got out. I said something about how it must be nice to run your own business or something like that. And Don essentially offered the business to me. At that time, and the age I was, it seemed kind of inconceivable. Q: You mentioned that Don built friendships with many of his models. Were there any models with whom he was particularly close? He was very appreciative of his models. He knew who they were. He wrote glowing biographies for most of his early models. I believe he really cared about them. He maintained lasting friendships with Eddie Williams, Jerry Abbott, Carter Lovisone, Dave Adducci, Pat Burnham, Keith Lewin, the Green brothers, Les Workman and others. Many of the models wrote letters to Don after they had moved away from Denver, or gone into the military as so on. Don sometimes stepped in to help his models in their personal lives. He helped Christopher Coe when he was in some serious trouble with the law. Even giving him a place to stay for several months. And I know a lot of people, not just models, who often went by the studio to just talk with Don. He was the type of guy you could go to with a problem. He would dissect it and help you analyze it and reduce it to its lowest common denominator. And when you left his office you might well feel as though you didn't have a problem at all. Q: Early male photography was typically presented to gay men only; a historically marginalized population in our society. How did Don’s family treat or respond to his work? Were there bad feelings, homophobia or embarrassment, or do you believe he was supported? Don was supported entirely by his immediate family. Parents, sisters, nieces and nephews, brother in law’s. He had very devoted relationships with cousins and other extended family. To my knowledge no one ever made a big thing about it. I think anyone who got to know Don personally, family or friends, always came to appreciate his talent and devotion to what he did. And most people respected him and accepted his work, even if it wasn’t their cup of tea. 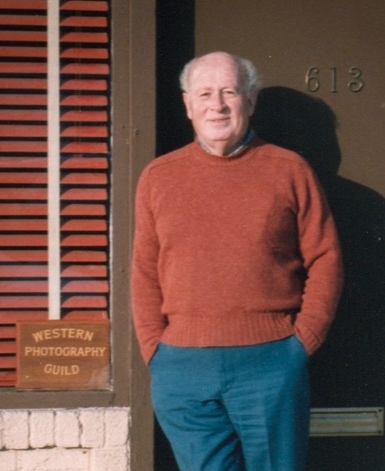 Q: How do you support and promote the Western Photography Guild legacy? I maintain the WPG website, with images and history about Don’s studio. I do my best to support people that are working on special projects and want to include WPG images or history. I really try to continue the studio’s tradition of good customer service. I also make fine quality reprints of Don’s work available, including some traditional darkroom prints. We offer the reprints through our website and on eBay. Q: To your knowledge, did Don ever experience legal issues as a result of his work? No, he never did. Don always ran the business straightforward as a legitimate enterprise. In the beginning, there was no hint that the material was intended mainly for gay men. He presented it as being for artists and bodybuilders, and aficionados of the male form. He truly believed that his photographs were meant for anyone who liked and wanted them, regardless of who they were. Don maintained this belief to the end. I have a fascinating letter that Don wrote to a New York publisher. At the time, the two were working on a book of Don’s photographs. (It was never published) In the letter, Don is protesting the publisher’s claim that WPG operated deceptively. Don gave the publisher a pretty detailed explanation of why he’d operated WPG the way he had. I will quote a part of this letter. "From day one we have never operated as appealing only to homosexuals. Our thought was that the well developed, artistically portrayed male body had universal appeal over the centuries and we wanted to continue the tradition in the current idiom. The appeal varies in nature and degree, but it is truly all-encompassing. On this basis, we could offer our work to a broad market and obtain models from a wide spectrum. This may seem sophistry, but it has guided us to this day, allowing us to operate straightforwardly for 42 years while many others have come and gone. "We do not consider homosexual an absolute term, but consider those termed homosexual, on average like everyone else. This belief is frequently resented by some on both sides of the fence, but it is deeply held by many. Thus to present Western (Photography Guild) as something of a masquerade for many years would be inaccurate, sort of an ex-post facto donning of a hair shirt. We have never had problems with the authorities, and I would find it difficult to deny the basis on which we have operated over the years. I realize a book has to appeal to its potential market, in this instance I think the truth has considerable interest for many. To my certain knowledge, it has had for many thousands of our customers, who are nothing if not articulate." I find this to be a fascinating insight into Don's thinking. Q: How did the epic Denver flood of 1965 affect Don and WPG? The flood dramatically affected Don and his studio. The original studio was only a couple hundred yards from the South Platte River at 173 Vallejo St. It’s now a vacant lot with a cell tower on it. There was a powerful storm that started in the mountains. It was unexpected, and it took time for the worst to reach Denver. Since there was some warning, Don and his assistant had left the studio before it struck. However, after leaving, the two decided to go back and remove some material. By then the police and national guard had the area blocked off. The worst of it hit almost right at midnight. It caused major damage. Don’s chief assistant, my father, and some of the models, all helped Don clean up after that flood. What could be salvaged was brought to my Dad’s garage. Q: How did the 1967 court ruling regarding “socially redeeming value” materials, which ultimately allowed the sale, transfer, and mailing of “pornographic” materials, affect Don’s work? Actually I think it caught him a little by surprise. While I don’t think he saw it coming, he eventually responded to it. Don’s “Naturale” work is some of his most beautiful, especially the late sixties and early 70’s material. By contrast, I’ve never felt that Don’s work from the late 70’s and early 1980’s was his best. I think the environment, and subsequently, his business, changed a lot as time went on. To me, he seemed to be pandering to the market rather than relying on his own aesthetic and style. However, as Don would say, “to each his own”. Q: How do you think the work of other photographers, such as Bob Mizer, may have affected Don’s business, work, and life? I’d say Mizer’s early work, and the work of Lon Hanagan, strongly influenced Don. I believe Don identified or related with the classic look of those old studio images. I feel I can easily see the influence in Don’s early studio work. Very soon, Don began photographing his muscular young models outdoors. When he started posing and photographing these men in the beautiful Colorado Mountains Don come into his own as a photographer and developed his own unique, “WPG” style. Q: What was Don’s connection to the Mr. Colorado contest? Don was one of the founders of the Mr. Colorado Association, along with Les Workman and Phil Dewald. He served as the director of the contest from 1950 to 1972. I really loved going to those contests as a kid. They were usually held at the Phipps auditorium in City Park, now an Imax theater. There was also a natural history museum and a zoo. As a child, I would play with the children of Don's friends and models. We had a blast and always got into trouble. Wonderful times. Q: Thank you very much for sharing all of this excellent information. Is there anything I haven’t asked you that you’d like to share?